Traffic was affected on the Wazirabad Road, the Bhajan Pura Main Road and Khajuri Chowk in northeast Delhi. Heavy rains lashed parts of the national capital Friday, causing traffic congestion at major intersections across the city and flight diversions from the IGI airport. 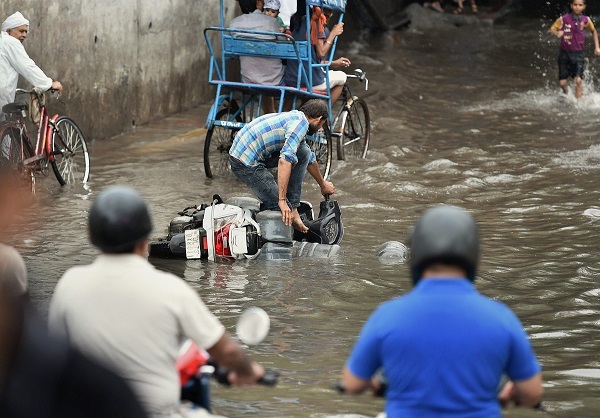 The downpour brought respite from the humidity, while causing waterlogging in many areas. Other routes affected due to waterlogging were between Old Gurugram Road towards Rao Mata Din Marg Crossing and Fun N Food Village in southwest Delhi, and Rajapuri Chowk and Palam Flyover in west Delhi. Sources at the IGI airport said 17 flights were diverted. Most diversions took place between 3.20 pm and 4.30 pm. According to MeT department, the humidity was recorded at 60 per cent. The minimum temperature was recorded at 25.6 degrees Celsius, a notch above the season's average. The weatherman has predicted light rains in several areas of the city tomorrow. "The skies will remain generally cloudy. There is possibility of light rain tomorrow," a MeT official said. The official said the minimum and maximum temperatures are expected to settle at 25.6 degrees and 34.4 degrees Celsius respectively.